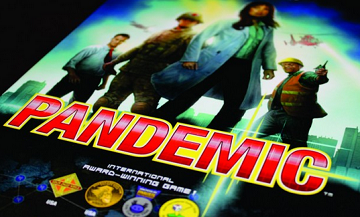 Today, we review the cooperative game phenomenon, Pandemic. Four virulent diseases rip their way through the world at the same time, and it’s up to you and your teammates – the other players at the table – to save humanity from annihilation. We’ll get to the exciting parts in a bit but first, we have to feed you some technical jargon. Players choose their role or pick one at random. Each role comes with a playing piece and a special ability unique to them. Place your playing pieces on Atlanta (since that’s the home of the Center for Disease Control), and then you set up the board. Each city depicted on the board has its own infection card that you could see in the infection card deck. 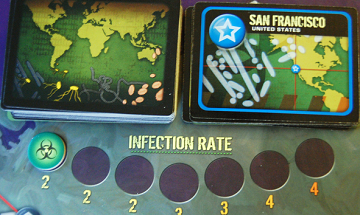 Pull three infection cards from the top of the deck and place three disease cubes on each of the cities shown on these cards. Then, draw another three infection cards and put two disease cubes on these cities. After that, you draw yet another three infection cards and place one disease cube on each one of these cities. All drawn infection cards go to the discard pile, and you’re ready to play. You get four actions during a turn and you can spend an action moving from one city to another, removing a disease cube from a city, building a research center, or curing a disease. Once you complete your actions, you have to draw two cards for your hand and then a certain number of infection cards based on the game’s infection level. Diseases can spread with epidemics and outbreaks, and there are plenty of ways to lose: running out of a particular color of disease cube, exhausting your player card draw pile, or the planet experiencing too many outbreaks. But there’s only one way to win: cure all four diseases. 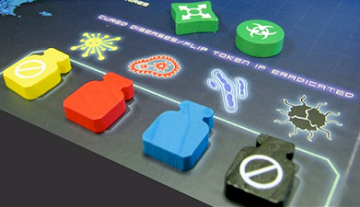 Pandemic appeals to a wide variety of gamers. 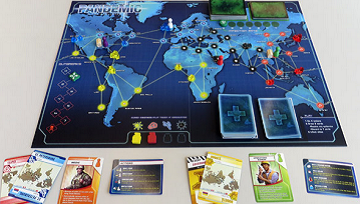 Whether you think of Ebola wiping out humanity or zombie apocalypse, Pandemic is topical and hip. I love the game mechanisms behind the Epidemic cards. Each Epidemic card has you move up the infection rate, infect a new city from the bottom of the infection deck, and shuffle the infection cards in the discard pile and place them on top of the infection deck. This escalates the spread of disease and incubation intensity. The game’s easy to learn and since Pandemic is a cooperative game, you can teach someone as you go. Like most Matt Leacock games, Pandemic has various difficulty settings. With Pandemic, you can play with all or some of the Epidemic cards, so you can ease newbies into its fast-paced gameplay. You feel the pressure of saving the world. Pandemic doesn’t just earn its cooperative game phenomenon status; it serves as a great gateway game for people who don’t play a lot of tabletop games: a must play.